Joss Whedon explains why he brought Agent Coulson back to life for S.H.I.E.L.D. We're amped that Clark Gregg will be reprising his role as Agent Phil Coulson on Joss Whedon's S.H.I.E.L.D.. But why, after the events of The Avengers, did Whedon decide to bring back a character who was busy being dead? It's because Whedon felt Gregg was the perfect guy to represent the Marvel Universe's non-superpowered heroes. 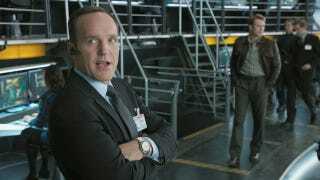 Cinema Blend reports that, at Whedon's SXSW panel, he confirmed what has been clear for some time now: Agent Coulson is very much alive in the world of S.H.I.E.L.D., which is set after The Avengers. How is it that Coulson is alive? "I'll tell you guys this," he joked, "Heimlich." So we don't know for certain whether Coulson's death in The Avengers was faked. The idea of the Little Guy is something that I am very fierce about, and there has never been a better Little Guy than Clark Gregg. That intrigued me, this world around the superhero community. It's the people whose shop windows get blown up when the Destroyer shows up. It's the more intimate stories that belong on television that we can really tap into the visual style and ethos, and even some of the mythology, of the Marvel movies. I think we've put together another really great ensemble headed by Clark.